This fine stele represents the god Viṣṇu, easily identifiable by his tall cylindrical crown (kirīṭa-mukuṭa) and the discus and conch held in his rear hands. The large size of these emblems and the small flames sprouting from them, as well as the discus turned endwise, are all stylistic marks of the end of the Pallava period (7th–9th centuries), as is the little strip of material sticking up from the topmost belt. The outline of the stele follows that of the figure. The god stands stiff-legged and wears an ankle-length transversely pleated dhoti, the man’s lower garment still worn by vast numbers of Indians today. There are three belts, the upper apparently jeweled and the lower (presumably of cloth) having outward-flowing side-ribbons and an ankle-length pleated strip hanging down on each side. The god wears a sacred thread (yajñopavīta) and stomach band (udurabandha); the former has a clasp by the shoulder and one strand joins the stomach band. Jewellry includes triangular foliate ear-rings, armlets (keyūras) with a central circular portion from which rise three jeweled spikes, a single broad necklace and three plain bracelets on each wrist. 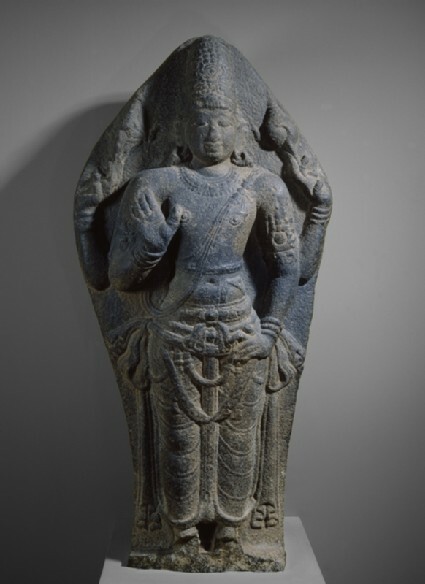 Monuments and sculpture in stone only appear in Tamilnadu in the 7th century, although their degree of stylistic development implies a previous tradition in perishable materials. Images of this type, both cut out of the living rock or in high relief on stele, thus stand fairly close to the emergence of the style which was to be continued so brilliantly under the early Coḷas. 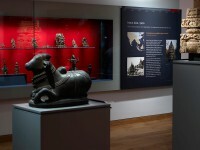 Due to its late appearance and the intense conservatism of sculptural style in South India (indeed through the whole Coḷa period that ends c.1250 A.D., there are no radical departures), the history of style in Tamilnadu follows a very different rhythm from that in other parts of India.